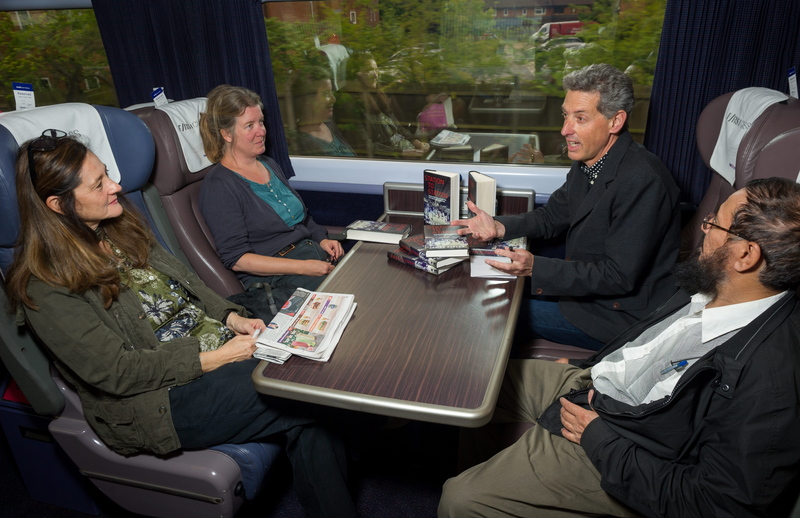 On the morning of Monday June 1st I rode from London to Bristol giving readings on the train. The train appeared on Platform 1 at Paddington on time: the books arrived. I’d timed the readings and knew how long I had between stations. Seats were reserved in a first class carriage, open to anyone who wished to take part. What could go wrong? Well, the tannoy on the train could pack up, for instance, so no one would know I was there. So it was necessary to go out into the carriages after each stop and introduce myself, feeling like a cross between a snake-oil salesman and a town cryer. Good author training: we’re just entertainers after all. I brought back a handful of adventurous people each time, which made for very personal readings and great discussions as we sped through the landscape. We had fun.